Last week I talk about spending quality time with your spouse. The goal was to get in at least 30-minutes every day of quality time and in an effort to better your marriage. Keep up on all my marriage tips here. My week was pretty hectic so this goal wasn’t accomplished every day. It will be a work in progress for me. There is nothing more important in your life than your health and your marriage. Both need to be made a priority and I’ll be actively working on it. Slow and steady wins the race, right? I have however been trying to do something nice every day and ensuring my husband knows he is loved. This week I’d like to focus on compliments. A great compliment can really turn an ok day into a great day! I think that there are times when us women forget that while it’s nice to receive a compliment we should also be giving them out to our husband. I know it’s a little awkward at times to give a man compliment but trust me he will appreciate it! 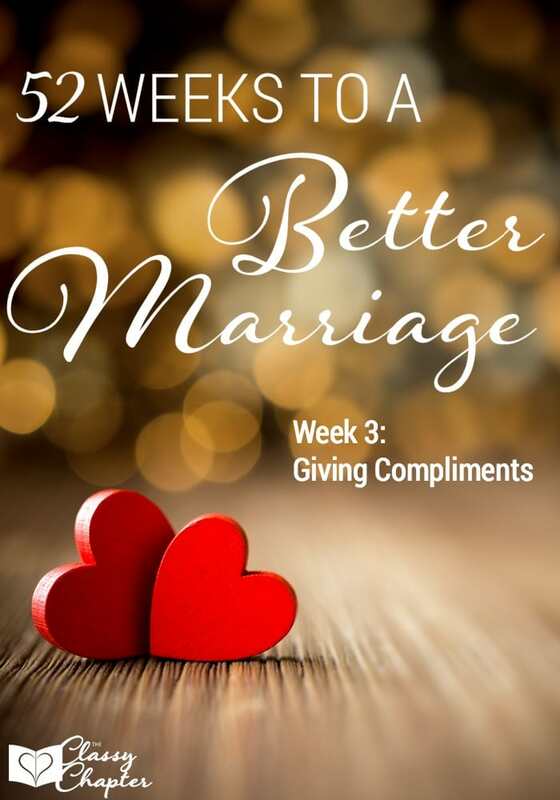 So the challenge this week is to give your spouse a compliment every single day. Tell him he looks handsome before he goes to work or just say something that you love about him. A small compliment can go a long way! I don’t give my husband compliments very often but when I do it always puts a smile on his face! If there is one thing I know about men, it’s that they like to know they are wanted and appreciated by their spouse. Men can’t read our minds so we need to verbally let them know how much we love them.